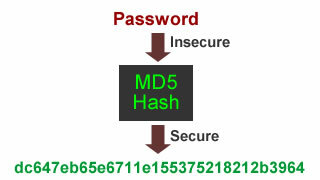 Share the post "MD5 Hash"
MD5 algorithm is mostly used to manage sensitive data such as storing, and comparing user account password. Any hashed data is currently impossible to reverse or decrypt to get the source. The only way to verify a correct password is by comparing the user provided (hashed using MD5) with the hashed password in the database. Tools to hash or convert your text or string using MD5 algortihm. Important : We do not log any information provided in the above field. Please provide some text to be hashed. Below is a simple PHP script as a tutorial for user login or authentication process. It shows how to match the provided password with the MD5 hashed password stored in the database. # Fetch the POSTed data. # Let's say we use a hard-coded username and password. $database_username="admin@k-ict.org"; # The username is normally stored as plain text in the database. $database_password="c6e737462801196f1ec10d400140e1ca"; # The password MUST be stored as hashed or encrypted in the database. # Hashed the POSTed data. # Attempt to match the the username (plain text) and password (MD5 hashed text). echo "You have provided a correct username and password. "; # Display the process result. echo "Sorry, you have provided an incorrect username or password. "; # Display the process error message. # Add link to go back to the previous form. You may use database like MySQL, or PostgreSQL to efficiently store data. Most programmers use those applications.